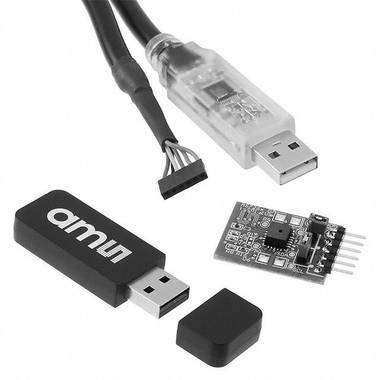 The Demo Kit consists of the Intelligent Spectral Interface (iSPI) board, USB/FTDI cable, and a USB stick which includes drivers, documentation and graphical user interface. The iSPI board is jumper selectable for either I2C or UART interface access via the USB/FTDI cable connection. The I2C interface presents a traditional register based device interface, while the UART interface allows high-level command access to the AS726x device features. The iSPI board includes unpopulated device pads for the installation of standard LED light sources suited to the specific spectral needs of the application. By default, the LED pads are unpopulated.